The Air Force views space as a medium, like the air or sea, in which to carry out different types of missions. Air Force doctrine specifically integrates space missions into the four basic roles performed by aerospace forces: force support, force enhancement, aerospace control, and force application. Force support, the ability to sustain forces, includes the space mission of on-orbit support for satellites.2 During the entire life of any satellite or military space system, from prelaunch checkout to on-orbit operations, there is a requirement for constant control, support, and direction of the satellite and its assigned mission. The Air Force maintains this critical operations capability through the Air Force Satellite Control Network (AFSCN). 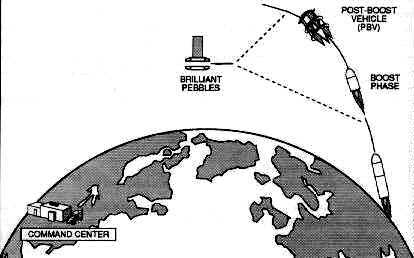 Low-altitude satellites are characterized by near-polar orbits, with altitudes ranging from 100 to 200 nautical miles. Their operational lifetimes are short, and the satellites have a short pass duration (2.5 to 10 minutes per tracking station). They are the most dynamic of all vehicles supported, requiring frequent command message transmission. Medium-altitude satellites generally have an orbital inclination of near 90 degrees, with altitudes ranging from 200 to 10,000 nautical miles. These satellites average one tracking station contact every other revolution, with a pass duration ranging from 10 to 20 minutes. Planned support is for one year or longer. High-altitude satellites usually have low-inclination (equatorial) orbits, with altitudes exceeding l0,000 nautical miles (NM). Their operational lifetimes are measured in years. Because of varied servicing support requirements, a support period (pass) may vary from five minutes to several hours. Included in the next category are ballistic missiles and suborbital test vehicles usually launched from the Western Space and Missile Center at Vandenberg AFB, California. Tracking and telemetry data for ascent and mid-course flight phases are recorded by the appropriate remote tracking stations (RTS). Total support time varies from 10 to 30 minutes. This kind of support requires considerable planning and readiness testing from the AFSCN. The AFSCN supports certain orbital vehicles during launch and ascent or during ascent only. Support may vary from 10 minutes to 16 hours (continuous), depending on a vehicle's orbital characteristics and the support requirements levied. Tracking and telemetry data retrieval is the primary support objective. 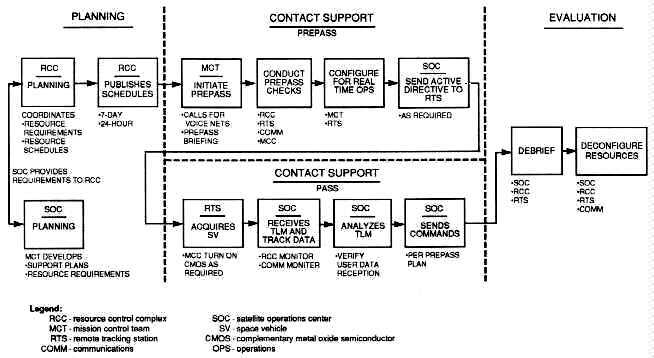 SOCs consist of hardware, software, and personnel that interact to accomplish these space support operations: resource control, mission control support, and communications control functions. Certain SOCs at Onizuka AFB, California, provide backup capability to Falcon AFB SOCs, while others are dedicated to unique programs not part of the AFSCN. Each SOC provides service for one or more specific satellite programs. Although the capabilities of SOCs vary, each is configured to support multiple satellite contacts simultaneously and/or to carry out premission rehearsals or exercises based on assigned satellite programs. SOCs are physically isolated from each other but are electrically connected to allocated range resources. The SOCs at Onizuka AFB are connected to the resource control complex (RCC) at Onizuka AFB, and the SOCs at Falcon are connected to the RCC at Falcon AFB. During a satellite contact, mission personnel exercise direct control of the assigned resources through on-line workstations in the SOC that access processing equipment, interactive controls, computer programs, and interfaces to internal and external elements. An SOC usually has two mainframe computers, one acting as a contact support processor and the other as a planning and evaluation processor. These processors, with associated software, carry out planning, contact support, evaluation, training and rehearsal, simulation, data base management, and system development. Space Handbook, Operations Training Division, 45th Space Wing , August 1991), 37. The planning phase mainly involves activities conducted by the SOC and the RCC. The SOC develops an overall contact support plan (CSP) and identifies what is required to support a particular satellite contact. The CSP includes resource requirements, telemetry parameters, and command and ephemeris data. The SOC may simultaneously prepare multiple satellite support plans. The result of this planning effort is requests by the SOCs and other users to the RCC for AFSCN resources. The RCC then produces a schedule for all AFSCN satellite support based on resources and priorities. There are both long-range and near-term schedules that dictate what resources can support specific satellite passes. Resource scheduling is an ongoing activity. There are opportunities throughout the planning phase to deconflict complex satellite pass support requirements. The pass support phase includes both prepass and satellite contact time. The SOC, RCC, RTS, and communications elements act in concert to configure all resources, conduct readiness testing, and place the systems into final configuration for the actual satellite support (pass). The SOC mission control team (MCT) initiates the prepass by requesting that the network communications voice operator establish communications nets. When the operator establishes the nets, the MCT members log on to their respective computer terminals to configure hardware and software. The MCT crew commander provides a briefing over an operations (OPS) communications net and the MCT ground controller (GC) briefs over another communications net, termed the configuration net. The GC briefs the RCC resource controller (RC), the lead communications operator (LCO), the Defense Communications System/Satellite Control Facility Interface System (DSIS) operator, the wideband operator, and the RTS antenna operator on data rates, communications and data channel activity, and overall resource configuration for the particular support. Upon briefing completion, the LCO, DSIS, and wideband operators perform channel checks. The RC then performs commanding, telemetry, and antenna slaving tests. The GC then performs similar readiness testing. During the testing period, all of the above elements are involved in the prepass checks and assist in troubleshooting and reconfiguring, if necessary. The RTS antenna is then positioned in preparation for satellite acquisition. Satellite contact begins when the RTS acquires and tracks the satellite. RTS makes contact by either sending out a turn-on command to activate satellite signals or by simply receiving transmitted satellite signals. The RTS in turn relays satellite telemetry data to the SOC while the RCC and communications elements monitor the operations in progress. The MCT evaluates the telemetry data in real time and verifies user data reception. The MCT may send commands to the satellite via the RTS according to the pass plan. The support ends when the objectives are met and the MCT commander directs the RTS to terminate tracking of the satellite. The evaluation phase is also the postpass phase. While the communications nets are still operating, the MCT crew commander discusses any support-related problems with the RTS, verifies the next pass time, and calls the network configuration voice operator to terminate the OPS net. The GC discusses any pass-related problems with people on the configuration net and releases the net participants through the RC. When the LCO notifies the RC that resources are normalized, and the MCT crew commander has directed the communications operators (wideband, DSIS, LCO, etc.) to terminate both nets, time-critical postpass activities are concluded, and the RTS and communications links are then available for another support. The MCT may continue such evaluation activities as analyzing payload data, satellite performance, data quality, and orbital parameters. RTSs are strategically located at nine sites with 16 antennas to maximize area coverage for timely and effective use of RTS resources as well as for flexible, multiple support capability (fig. 2). The RTSs are available to control complexes on a time-shared basis for supporting satellite operations and are a scheduled resource. Scheduling is accomplished by the RCC at either Falcon AFB or Onizuka AFB. The RCC allocates time to each RTS for operations, maintenance, and training. Space Handbook, Operations Training Division, 45th Space Wing , August 1991),24. The RTSs within the AFSCN have been modernized as automated remote tracking stations (ARTS). ARTS sites may be a new site, such as the Colorado Tracking Station at Falcon AFB, or a modernized existing RTS site, such as the Vandenberg Tracking Station. All RTSs or ARTSs, while not identical in physical layout, function in approximately the same manner. Some RTSs are configured with additional equipment to support unique missions. We can visualize an RTS's antenna coverage as a cone, widening as the distance from Earth becomes greater. With higher satellite altitudes, a wider selection of RTSs can support a given satellite contact. RTSs are functionally equivalent to each other and are scheduled for operations based on satellite support needs and the visibility of the satellite to the RTS. Satellite operations events such as TT&C directives, vehicle status and health, and SV commanding data--all pass between the mission control centers and the RTSs over communications links. The RTS uplink transmits satellite command data upload and ranging data. Satellite telemetry and ranging are received in as many as four simultaneous downlinks and transmitted via the communications system to control complexes. The telemetry function involves tracking in the reception of information on the health, status, and mission payload telemetry of a satellite. An RTS receives satellite telemetry data and transmits this data to a control center. The tracking function involves satellite location and velocity determination. Antenna azimuth and elevation pointing data direct the antenna for satellite acquisition. After acquisition, the RTS transfers range and range-rate data, antenna pointing data, and status information to the control centers, usually via the DSIS. The SOC uses control center tracking data to predict future satellite contacts and to generate antenna pointing data, for real-time acquisition by remote tracking antennas. The command function includes transmitting coded signals to a satellite to do such things as fire thrusters, start or stop mission tasks, switch power sources, or update sequence programs. The SOC transfers encrypted or clear blocks of command data to the RTS for transmission to the SV. Verification and authentication for each command is normally within the satellite telemetry transmission to the RTS ground antenna and back to the SOC. The SOC then verifies that the satellite properly received the transmitted commands. Remote Tracking Station Communications. Each RTS has communications capabilities that provide primary and alternate connectivity for data and voice circuits to and from control complexes. One capability is to encrypt and decrypt information and to communicate intrastation via intercom or telephone. Primary communication is accomplished using the DSIS, which links the RTS, via the Defense Satellite Communications System (DSCS) or commercial communication satellites, with either Falcon or Onizuka AFB. Alternate communications links carry digital voice and data, usually on leased commercial telephone circuits, between all AFSCN RTSs and external users. The capabilities of these links vary considerably depending on the support requirements of the different control complexes. An additional communications system used by the AFSCN is called Mission-22 (M-22). It uses DOD host vehicles that are in highly elliptical orbits. Just as the AFSCN is a complex assembly of elements supporting US space assets, the communications links required to carry out the AFSCN mission are a complex suite of networks within and between all elements of the AFSCN and external users. These communications links provide communications security, redundancy, data recording, and interface capability with communications satellites, land lines, fiber optics, and microwave circuits for transmission of data, voice, teletype, and facsimile information. The wideband communications network provides the primary communications links used in the AFSCN between the control centers and the RTSs. This network uses the DSIS, which links the RTS via DSCS II and DSCS III satellites or commercial communication satellites with either Falcon or Onizuka AFBs. DSIS provides high data rate communications between the RTSs and the control centers. Narrowband communications are an alternative to the wideband system for data and digital voice capability. Additionally, the network uses M-22 communications satellites that provide the capability of minimum essential wideband support in the event of any wideband link outages to any RTS. Some RTSs have a data link terminal (DLT) to specifically utilize M-22. An RTS with two antennas, but no DLT, can still use M-22 for real-time transmission if one antenna tracks, while the other relays data via M-22. The M-22 data rate is limited, but its capability fulfills most present and future vehicle reception requirements. Remote Tracking Station--Mission Unique Interfaces. RTSs also interface with dedicated elements within the AFSCN in support of specific requirements of the DMSP and GPS programs. Specific mission unique interfaces at the Thule (Greenland), Hawaii, and New Hampshire RTSs provide DMSP support. The RTSs provide an interface for command and telemetry data between the RTSs and the dedicated DMSP elements. The dedicated elements of the DMSP are the Multi-Purpose Satellite Operations Center and the Fairchild Satellite Operations Center. The RTSs provide an interface for primary mission data recovery for transmission to the Air Force Global Weather Central, as well as to the Navy Fleet Numerical Oceanography Center. A mission unique enhancement at the Colorado Tracking Station (CTS) provides GPS program support. This mission unique interface provides the CTS with a GPS ground antenna command and telemetry processing capability--which allows the GPS SOC at Falcon AFB to directly control the CTS. 6. conducting training exercises, both internally and in conjunction with other elements involved with US space assets. The 750th Satellite Tracking Group OC, located at Onizuka AFB, serves as a subcenter of the WCP at Falcon AFB. The OC plays an active role in providing downward direction to the RTSs and in channeling information from the RTSs to the WCP. The OC provides a backup capability for command and control of the AFSCN if the WCP cannot sustain its mission. The OC also interfaces with control centers at Onizuka AFB that are dedicated to programs not supported by the AFSCN. The NCS mission compromises four different categories: plans and analysis (P&A), resource scheduling (RS), resource control (RC), and inter-range operations (IRO). The plans and analysis branch collects long-term resource utilization requests for flight preparation and nonflight activities. It then develops long-range forecasts and schedules and distributes them to affected elements. P&A also analyzes resource utilization, system performance, and other associated data. The resource scheduling branch collects flight resource utilization requests and combines them in a common data base with requests collected by plans and analysis. RS schedules the common-user resources, identifies conflicts, and coordinates conflict resolution in the non-real-time planning period. RS also requests, when necessary, support of internetted resources from appropriate agencies. RS then publishes and distributes the established schedule, performs real-time changes and conflict resolution, and makes data base updates. The resource control branch configures network common-user resources, conducts prepass and readiness testing, and transfers resource control to the user. RC also monitors resource status and reallocates resources to users in real time as determined by RS. Other RC activities include resuming control of resources released by users, being the focal point for resource outage and restoration status reports, coordinating maintenance activities, and initiating fault localization and isolation testing as required. RC also exercises control over the start, stop, and failure switchover of all scheduled communications link connectivities between the communications control complex (CCC) and AFSCN users. Interrange operations organizations are located at both Falcon AFB and Onizuka AFB. IRO is the single operational interface through which external space agencies (e.g., NASA) without affiliated SOCs request and obtain support from AFSCN resources. IRO reports operationally to the WCP, but is functionally part of the NCS. IRO obtains early orbit determination and computation of miss-between-orbit data from the Space Defense Operations Center (SPADOC) and provides predictive avoidance data support to SPADOC. The IRO also performs satellite management support and radio frequency interference analyses and predictions. The NCS consists of hardware, software, personnel, operational procedures, and facilities that interact to provide for scheduling, allocating, configuring, and testing of AFSCN common-user resources. The NCS analyzes resource usage; monitors resource status; conducts fault detection, localization, and isolation for all network resources; and provides the interface for users and resources external to the AFSCN. Falcon AFB currently does not have primary independent connectivity to the RTSs. An interim configuration called "Backhaul" connects Falcon to the RTSs by going through Onizuka AFB via a domestic satellite link. The remote communications/telemetry areas (RC/TA) are the remote termination of the mission communications links at the RTSs. The RC/TA performs monitor, circuit restoration, and troubleshooting functions similar to a CCC at a control center. Primary and alternate communications links internet the AFSCN control centers and the RTSs. These links provide interstation and intrastation communications to common-user elements. Interstation communications consist of primary and alternate communications links connecting control nodes with other AFSCN and external facilities. Intrastation communications distribute data and voice communications within various complexes, control centers, and RTSs. A number of AFSCN communications functional areas should be highlighted. The recording, storage, and playback area is located at the RTSs and common-user control centers. This area serves as a backup for real-time receive activities and as non-real-time playback for satellite support activities. Types of data involved are primary and backup telemetry, voice, time, and command/control/status signals. The CCC records information by exception; therefore, users must schedule any recording. The AFSCN communications system provides the necessary interface equipment to permit access between satellite and various terrestrial communications agencies. This area, which includes communications satellite links, interconnect facilities, leased common carrier communications links, and commercial telephone, provides the primary and alternate connectivity between the globally dispersed AFSCN elements. Force enhancement multiplies combat effectiveness. Space operations contribute directly to the combat effectiveness of our military forces within several mission areas: spacelift, surveillance and reconnaissance, navigation, communications, and meteorology. Provide real-time, survivable, and enduring communications, surveillance, environmental monitoring, navigation, and warning for unified and specified commanders (and their component commanders), the national command authorities, and the intelligence community. Provide the potential for rapid decision and response actions by the NCA and war-fighting commanders at all levels. Space resources can rapidly distribute information to forces worldwide. Space systems can aid commanders to reduce the time required for observation-orientation-direction-action feedback. Support national and international space rescue plans. Spacelift provides the capability to emplace and replace critical space assets. Spacelift (or launch) operations deliver military space systems to the required operational orbit or location in space. The spacelift mission entails a wide variety of complex activities required to place the satellite into the proper operational orbit. Spacelift includes preparing the various segments of the space launch vehicle, erecting or stacking the launch vehicle on or near the launchpad, integrating the mission payload(s) with the launch vehicle, conducting a thorough prelaunch checkout of all systems, and conducting the actual operations of countdown, launch, and flight of the space vehicle into orbit.20 Additional detailed information on various spacelift (launch) vehicles is in chapter 4 of this volume. The following section provides information on two key US space systems that have a long history of success. These systems are only samples of US surveillance and reconnaissance satellite systems. Some of these technologically advanced systems are classified and this volume does not cover them. Defense Support Program. The Defense Support Program (DSP) is an integral part of the nation's missile warning system operated by the US Air Force Space Command. The satellites report on real-time missile launches, space launches, and nuclear detonations. They have been the spaceborne segment of the North American Aerospace Defense Tactical Warning and Attack Assessment System since 1970. Landsat. Landsat is a civil satellite system developed by NASA to provide land, surface, and ocean data. Initially developed in the late 1960s, the primary Landsat mission was to demonstrate the feasibility of multi-spectral remote sensing from space for practical Earth resources management practical applications. The overall system requirements were acquisition of multi-spectral images (MSI), collection of data from remotely located ground stations, and production of photographic and digital data in quantities and formats most helpful to potential users.21 Another requirement was that Landsat take the data in a specific manner: repetitive observations at the same local time, overlapping images, correct locations of images to within two miles, and periodic coverage of each area at least every three weeks. Currently, data from Landsat is collected at three US ground stations located in California, Alaska, and Maryland. Through bilateral agreements, ground stations located in Canada, Brazil, Argentina, Japan, India, Italy, Australia, Sweden, and South Africa are also receiving data.22 All data for US consumption is sent to the Goddard Space Flight Center for preprocessing. After preprocessing, the data is transmitted electronically to the Earth Resources Observation System Data Center (EDC) in South Dakota for final processing. The resultant data is then available to users through EDC as photographic imagery or digital data tapes. Landsat 4 and 5, the second generation of the Landsat series, carry two sensors: a multi-spectral scanner (MSS) and a thematic mapper (TM). The thematic mapper is a new sensor that has a ground resolution of 30 meters for the visible and near-infrared bands.23 The MSS records four images of a scene, each covering a ground area of 185 kilometers (km) by 185 km at a nominal ground resolution of 79 meters.24 The images are produced by reflecting radiance from the Earth's surface to detectors on board the satellite. Two large applications of Landsat data are mapping land cover and monitoring change, both aquatic and terrestrial. The TM sensor is able to record four times as many radiance levels as the MSS sensor and has better resolution. This enhanced resolution and increased radiance level capability provides greater detail for vegetation absorbance, land/water contrasts, and geological discrimination applications. The Landsat program, originally under NASA, has suffered from a lack of a stable home in the competition between programs for funding. The National Space Council shifted the program to the Commerce Department in 1979 in a commercialization plan that would eventually place it under private ownership and operation. That effort brought in smaller revenues than expected and the program languished. If Landsat 4 and 5, launched in 1982 and 1984 respectively, had not exceeded their three-year-design lifetimes, the US would be without a civil Earth observation spacecraft. 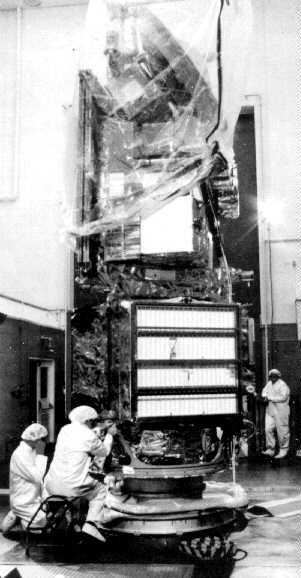 Landsat 6, scheduled for launch in mid-1992, should operate for five years, during which time Landsat 7 should be launched. The Global Positioning System is a space-based radio navigation network operated and controlled from Falcon AFB. The Air Force launched the first research and development satellite in February 1978. 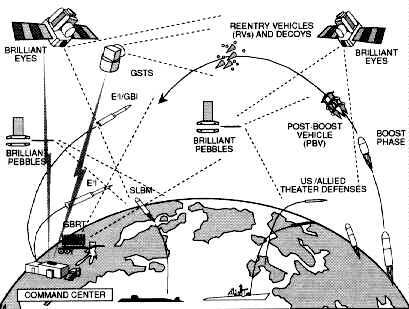 As of February 1991, the GPS network consisted of six Block I R&D satellites, and 10 Block II operational satellites. This 16-satellite constellation should grow to 21 satellites plus three on-orbit spares by the mid-1990s. GPS is a navigation system designed to provide US and allied land, sea, and air forces with worldwide, three-dimensional position and velocity information. The system consists of three segments: a space segment of satellites that transmits radio signals, a control segment of ground-based equipment to monitor the satellites and update their signals, and a user equipment segment of devices to passively receive and convert satellite signals into positioning and navigation information. When fully operational, GPS will provide 24-hour, all-weather, precise positioning and navigation information from satellites circling the Earth every 12 hours and emitting continuous navigation signals. It will also provide such support to civilian users. The Air Force launches GPS satellites from Cape Canaveral AFS, Florida, using a Delta II launch vehicle. The satellites are put into 11,000 nautical mile circular orbits. The GPS constellation will have six orbital planes with four satellites in each. Satellites will transmit on two different L-band frequencies. The design life of the operational satellites should be seven and one-half years. The GPS master control station located at Falcon AFB monitors and controls the GPS constellation. Five widely separated monitor stations passively track the satellites and accumulate navigation signals. Three globally dispersed ground antennas act as the two-way communications link between the MCS and the satellites. Through these links, crews in the MCS update the satellites' computers, allowing them to maintain the health and orbit of GPS satellites, monitor and update navigation signals, and synchronize the satellites' atomic clocks. GPS data aids land, air, and sea vehicles in navigation, precision weapons delivery, photographic mapping, aerial rendezvous and/or refueling, geodetic surveys, range safety and instrumentation, and search and rescue operations. This system provides military users highly accurate, three-dimensional (longitude, latitude, and altitude) position, velocity, and time information. With proper equipment, authorized users can receive the signals and determine their location within tens of feet, velocity within a fraction of a mile per hour, and the time within a millionth of a second. To obtain this information, the user set will automatically select the four most favorably located satellites, lock onto their navigation signals, and compute the position, velocity, and time. This section discusses the primary communications satellite systems used by the US Air Force. Communications systems that other services use extensively for specific purposes are not covered in this volume. Defense Satellite Communications System. The DSCS provides the DOD, the Department of State, and other US government agencies secure, high-capacity communications that a commercial service or military system cannot provide. The Defense Communications Agency manages operational use of the communications capabilities provided by the network of satellites, ensuring proper allocation of frequency and bandwidth to users based upon their requirements. 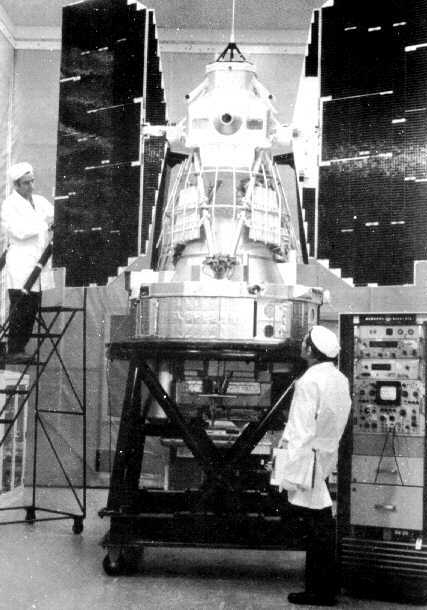 In the 1960s the DOD began to build a network of satellites for military communications. This program advanced through three phases incorporating improved technology and enhanced capabilities with each phase. Between June 1966 and June 1968 in Phase I of the program, the Air Force launched 26 small communications satellites, each weighing about 100 pounds. 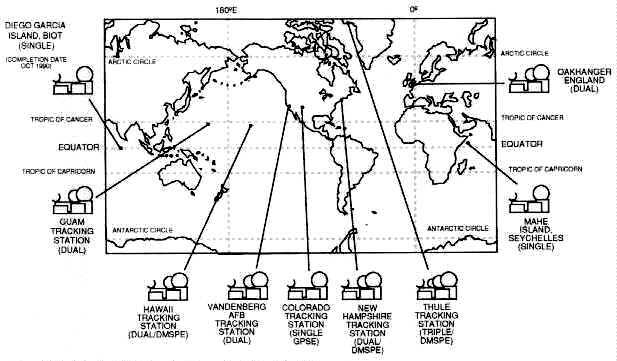 Each satellite had one channel and relayed voice, imagery, computerized digital data, and teletype transmissions. Designers planned for the satellites to last three years. Phase I satellites operated in a circular orbit 20,930 miles above Earth at a speed that nearly kept each satellite over a point on the equator. 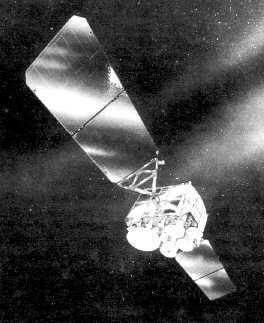 DSCS II launched its first satellites in 1971 and is the second generation military communications satellite program. The 3d Satellite Control Squadron currently flies DSCS II satellites from Falcon AFB. DSCS II has increased communications load capability and transmission strength, and double the lifetime expectancy of the Phase I satellites. DSCS II has an attitude control system for orbital repositioning. 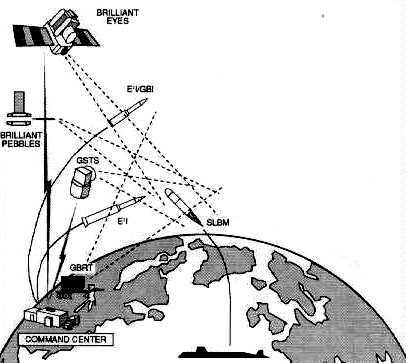 Ground command can steer the two-dish antennas on DSCS II satellites and can concentrate the antennas' electronic beams on small areas of the Earth's surface for intensified coverage. NATO III is a cylindrical, spin-stabilized satellite with a design life of seven years. It is 86 inches in diameter, 110 inches in height, and weighs 783 pounds. Solar arrays cover the sides of the satellite body, and there are thermal shields on the top and bottom. The command and control antenna encircles the vehicle, and three communications antennas are atop the satellite on a despun platform. The communications payload is a repeater providing both narrowbeam and widebeam coverage of the North Atlantic region. This payload provides multiple carrier reception, frequency translation, amplification, and retransmission of X-band signals. The apogee kick motor and two axial thrusters are on the bottom of the vehicle. All electronic equipment, the hydrazine tanks, and radial thrusters are on the main equipment platform in the center of the vehicle. The AFSCN launched the NATO III satellites from the Eastern Test Range aboard Delta boosters between April 1976 and November 1984 and placed the four vehicles in elliptical transfer orbits of approximately 23 degree inclination. At approximately fifth apogee, an apogee kick motor fired, circularizing the orbit and reducing the inclination. NATO III will eventually take on a backup mission when NATO IV becomes operational in the early 1990s. The ground segment of the system consists of communication terminals on most US Navy ships and submarines, selected Air Force and Navy aircraft, global ground stations, and presidential networks. Individual users acquire and manage these terminals. Two deployable solar array panels, which supply approximately 1,500 watts of power, provide the primary electrical power for the satellite. The span of the deployed solar array panels is 43 feet. In addition, three nickel-cadmium batteries provide power during eclipse operations at the spring and autumnal equinoxes. The design life of the satellite is five years. 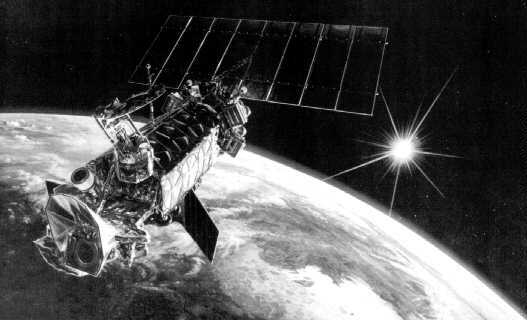 The Defense Meteorological Satellite Program has been operational since July 1965. Its military mission is to generate weather data for operational forces worldwide. The Air Force is the DOD executive agent for this program. The Department of Commerce's National Oceanic and Atmospheric Administration furnishes meteorological data to the civilian community. Satellites in the DMSP meet unique military requirements for worldwide weather information. DMSP satellites provide meteorological data in real time to Air Force, Navy, and Marine Corps tactical ground stations and Navy ships. Through these satellites, military weather forecasters can detect developing patterns of weather and track existing weather systems over remote areas. Data from these satellites can help identify, locate, and determine the intensity of such severe weather as thunderstorms, hurricanes, and typhoons. Agencies can also use the data to form three-dimensional cloud analyses, which are the basis for computer simulation of various weather conditions. All of this quickly available information aids the military commander in making decisions. For example, data obtained through this program is especially valuable in supporting the launch, en route, target, and recovery portions of a wide variety of strategic and tactical missions. Air Force Space Command's 6th Space Operations Squadron (SOPS) at Offutt AFB, Nebraska, and Detachment 1 of the 6 SOPS at Fairchild AFB, Washington, provide command and control of DMSP satellites. Current satellites in the DMSP are designated as the Block SD-2 integrated spacecraft system because the functions of the launch vehicle's upper stage and the orbital satellite have been integrated into a single system. This system navigates from lift-off and provides guidance for the spacecraft from booster separation through orbit insertion, as well as electrical power, telemetry, attitude control, and propulsion for the second stage. Block SD-2 has many improvements over earlier DMSP satellites, including more sensors with increased capability and increased life span. The satellites circle the Earth at an altitude of about 450 NM in a near-polar, Sun-synchronous orbit. Each satellite scans an area 1,600 NM wide and can cover the entire Earth in about 12 hours. Three reaction wheel assemblies, which provide three-axis stabilization, maintain pointing accuracy of the satellites. The SD-2 spacecraft has five major sections: a precision mounting platform for sensors and other equipment requiring precise alignment, an equipment support module that encloses the major portion of the electronics, a reaction-control equipment support structure that contains the spent second-stage rocket motor and supports the ascent-phase reaction-control equipment, a solar cell array, and the booster adapter. The Sun-tracking, deployable solar array is covered with 12,500 silicon cells that produce 1,000 watts of power for operating the spacecraft systems. The booster adapter provides electrical interfaces between the satellite and ground test equipment and is the structural interface between the satellite and the booster. The primary sensor on board the satellite is the operational linescan system that "sees" visible and infrared cloud cover imagery used in analyzing cloud patterns. Also, the spacecraft can carry secondary payload sensors. For example, one sensor measures temperature and moisture; another accurately measures the location and intensity of the aurora to aid radar operations and long-range ground communications in the northern hemisphere, a third measures the precipitating electrons that cause the aurora; a fourth sensor measures X rays, and a fifth sensor measures soil moisture, atmospheric moisture, and sea state. The normal on-orbit DMSP constellation currently consists of two operational satellites. 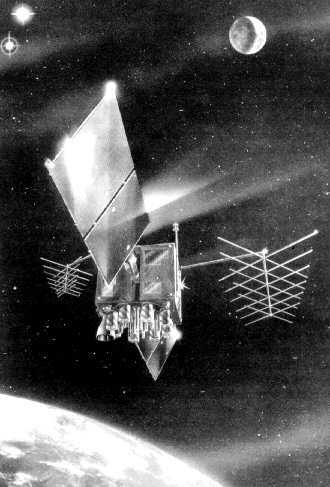 To date, the DMSP has placed six Block SD-2 satellites on-orbit. Block SD-2 satellites are launched on Atlas-E boosters from Vandenberg AFB, California. In 1988 Gen Larry D. Welch stated that "spacepower will assume as decisive a role in future combat operations as airpower has today. ''31 Aerospace control includes the ability to control the combat environment. Aerospace control is the ability to assure the use of space systems during conflict while denying the enemy the use of his space systems.32 The mission is called counterspace and embodies the idea of space superiority over the battlefield. The ability to achieve and maintain aerospace control has been and continues to be a critical mission of the US Space Command. space surveillance--the ability to surveil and monitor continuously all significant military activities in space. The surveillance mission is necessary to execute one or both of the following two missions. protection--the ability to protect friendly space assets. This mission is also referred to as defensive counterspace. 1. Providing operational command and control of the SSN. These activities include tasking of sensors to provide tracking support for routine space catalog maintenance, space object identification, and special events monitoring. 2. Maintaining a catalog of orbital characteristics of all observable man-made space objects for position prediction. 3. Providing routine space operations information. The center's catalog dates back to 1957 with the Soviet Union's launch of Sputnik I. Since that time, the center has cataloged more than 21,000 objects. Currently, over 7,000 of these objects remain in Earth orbit.37 While the SSC is primarily interested in satellite vehicles (or payloads), it also keeps track of space debris. This includes items such as spent rocket bodies, launch hardware, and other objects from operating satellites. It also includes fragments resulting from in-space breakups of larger objects. In fact, the vast majority of objects now in space are pieces of debris. Although the SSC has the ability to track and monitor thousands of pieces of debris, many go undetected because of their minute size. It is possible that tiny pieces of debris, the size of paint flecks, may actually number in the millions. The SSC also has a backup operations center, the Alternate SSC or ASSC. The ASSC is part of the Naval Space Surveillance (NAVSPASUR) system in Dahlgren, Virginia. The ASSC maintains the satellite catalog when the computational capability or the command and control capability of the SSC fails to function properly. Dedicated Sensors. Dedicated sensors support the space surveillance mission. They include three unique optical systems, a combined radio frequency (RF) and optical system, a phased array system, a mechanical tracker radar, and a "radar fence" operated by the Navy. The ballistic missile early warning system (BMEWS) sensors contribute to the space surveillance mission. These sensors are somewhat limited in the performance of the space surveillance mission since planners designed each radar primarily to perform a missile warning mission as opposed to the spacetrack and identification mission. Each radar is unique in its ability to contribute to the space surveillance mission. For example, the perimeter acquisition radar attack characterization system (PARCS) sensor currently contributes over 15 percent of the observations used to maintain the spacetrack catalog. However, due to the geographic location and positioning of its one-face phased array radar, PARCS does not play a significant role in new foreign launch (NFL) processing, nor is it able to track a significant portion of deep-space objects. The Pirinclik, Turkey, RADINT site operates both a detection radar (AN/FPS- 17) and a mechanical tracking radar (AN/FPS-79). Both radars operate at an UHF (432 MHz) frequency. Although limited by their mechanical technology, Pirinclik's two radars give the advantage of tracking two objects simultaneously in real time. Its location close to the southern Soviet Union makes it the only ground sensor capable of tracking actual deorbits of Soviet space hardware. In addition, the Pirinclik radar is the only 24-hour-per-day eastern hemisphere deep-space sensor. There are two contributing sensors located at Tyngsboro, Massachusetts. 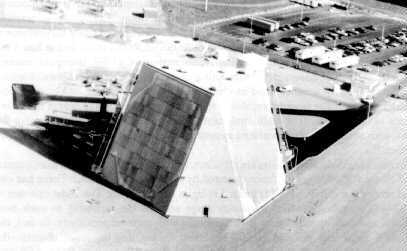 The Haystack radar, an X-band radar, operates at 10 gigahertz and is the only wideband radar in the western hemisphere able to image in deep space. Haystack operates eight scheduled five-day sessions and two recalls per year. (A recall requires four to eight hours to reconfigure equipment.) The other contributing sensor at Tyngsboro, is the Milistone L-band radar, operating at 1,295 MHz. Milistone is contracted by the USAF for about 80 hours per week. The Space Defense Operations Center (SPADOC) is located in Cheyenne Mountain and serves as a fusion center for the space control mission. SPADOC is responsible for protecting DOD, US civilian, and allied nation space systems. SPADOC fulfills its mission responsibilities primarily through monitoring space and space-related activities, informing members of the space community of unique space-related events, and planning possible defensive countermeasures.48 To achieve its objectives, SPADOC specifically monitors and reports abnormal or unusual space activity, and recommends the necessary follow-on steps to specific organizations. SPADOC also analyzes possible threat attack information, determines the time and location of the attack, and identifies both the space system under attack as well as the method and type of attack taking place. Finally, SPADOC advises specific organizations of which US space systems are vulnerable to attack or are likely to be targeted for attack. The primary method of secure connectivity between SPADOC and all space system owners/operators is the Space Defense Command and Control System (SPADCCS). SPADCCS is a communications network using hard copy messages to and from SPADOC and space system owners/operators. The final space control mission--offensive counterspace--is categorized by the term negation. The ability to negate or destroy any hostile space system includes the use of an antisatellite (ASAT) system. The US does not currently operate a functional ASAT system. Any future system will serve as an integral part of USSPACECOM's plan to achieve total space control. This section provides a broad overview of ballistic missile defense (BMD) planning as outlined by the Strategic Defense Initiative Organization (SDIO). The discussion includes a review of BMD concepts, an overview of the global protection against limited strikes (GPALS) concept, and a look at a potential GPALS architecture. 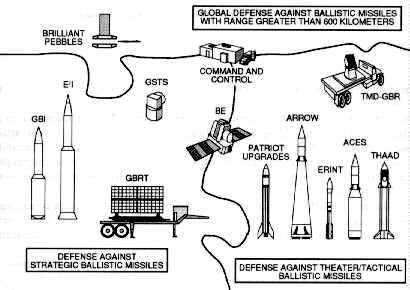 The section concludes with a discussion of follow-on systems showing how a GPALS system could evolve into a stronger form of ballistic missile defense. In the 1980s a technologies study (Fletcher study) concluded that the most effective strategic defensive systems would have multiple layers. The concept of multilayered defense continues to be the conceptual cornerstone of GPALS. Specifically, the GPALS system consists of layers referred to as boost/postboost, midcourse, and terminal. Boost/Postboost. The period of a ballistic missile's flight while the booster is thrusting through the time it deploys its reentry vehicles (RV) and possible decoys. Midcourse. The relatively long period of time RVs and decoys coast along their ballistic trajectories in space. To illustrate the GPALS concept, figure 4 depicts an integrated system consisting of three interlocking pieces.69 The size of each piece reflects the relative investment projected for the three main parts of the GPALS. Specific elements are discussed under the section on GPALS architecture. 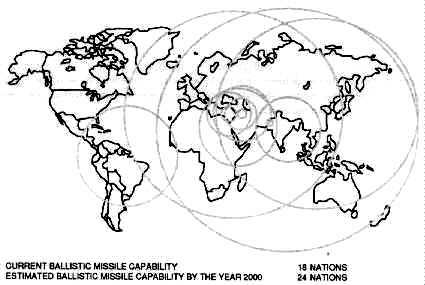 Given US experience with theater ballistic missile threats in the Persian Gulf War and the fact that these threats will become more sophisticated in the future, the US is pursuing development and deployment of advanced theater defenses by the mid-1990s as an urgent priority. These ground-based theater defense interceptor systems would provide midcourse and terminal defense capability. Interceptors could be based in-theater continuously (or moved to hot spots as needed), on ships, or on aircraft. 1. BP interceptors would have the potential for continuous worldwide coverage. 2. 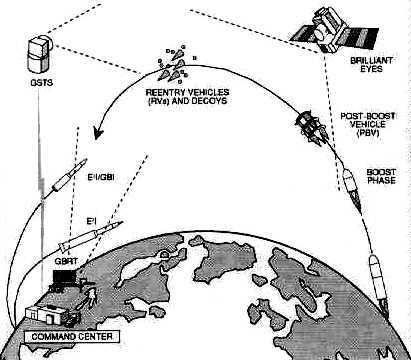 The sensing capability of BP will provide additional tactical warning information to the national command authorities in the event of a ballistic missile attack, as well as provide cueing to elements of the GPALS system and to the Brilliant Eyes (BE) satellites. add such directed energy weapons as lasers (i.e., space-based and/or ground-based) and/or neutral particle beams. 1. "Space Operations Functions," vol. 10, course materials for ACSC (Maxwell AFB, Ala.: Air Command and Staff College, 1991), 60; and Lt Col Steve Malutich and Maj Jim Dill, "Space Support," vol. 10 (Maxwell AFB, Ala.: Air Command and Staff College, 1991), 61-64, 67. 2. Maj Theodore W. Burgner, "Space Handbook" (Paper presented as input for revision of Space Handbook, 45th Space Wing Operations Training Division, August 1991), 12. 18. 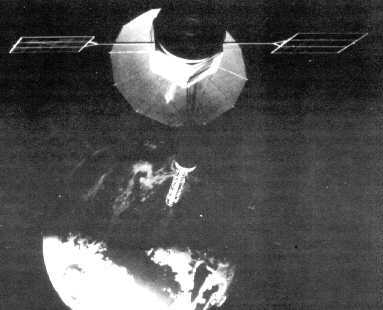 AFM 1-6, Military Space Doctrine, 15 October 1982, 63. 21. Nicholas M. Short, The Landsat Tutorial Workbook (Washington, D.C.: NASA, 1982), 409. 22. House Committee on Science and Technology, Civil Land Remote Sensing System, 97th Cong., 1st sess., 1982, Committee Print, 9. 23. H. S. Chen, Space Remote Sensing Systems (San Diego, Calif.: Academic Press, Inc., 1985), 216. 24. Paul J. Curran, Principles of Remote Sensing (New York: Longman, 1985),141. 26. Patricia A. Gilmartin, "France's Spot Satellite Images Helped U.S. Air Force Rehearse Gulf War Missions," Aviation Week & Space Technology, 1 July 1991, 22. 31. James W. Canan, "Normalizing Space," in Space the Fourth Military Arena, ed. Connie Sessions and Gwen Story (Maxwell AFB, Ala.: Air University, 1992), 239. 32. AFM 1-1, Basic Aerospace Doctrine of the United States Air Force, vol. 1, March 1992, 9. 34. Capt Larry Jacks, "Space Surveillance Network," 1 SWG/DOOS paper, June 1991,1. 47. Maj Steven R. Petersen, Space Control and the Role of Antisatellite Weapons (Maxwell AFB, Ala.: Air University Press, May 1991), 63. 51. Strategic Defense Initiative Organization, 1991 Report to the Congress on the Strategic Defense Initiative (May 1991), 2-1. 65. Strategic Defense Initiative Organization, The President 's New Focus for SDI: Global Protection against Limited Strikes (10 April 1991), 2. 66. SDIO, Report to Congress, 1-5. 75 . Ibid., 2-5 .